Hi Midnight in the UK! Happy Pet of the Day! What a beautiful Lop-Eared bunny you are, Midnight! Your sleek and shiny, ebony colored coat is gorgeous, and that sweet face of yours could melt the hardest of hearts! What I wouldn't give to stroke those long, velvety ears! Thanks to your human for sharing those heart-melting photos with us! I see you really know how to get into the Christmas spirit! hehe How very lucky your human is, having a bunny furkid as sweet and cuddly, as joyful and life loving as you, Midnight! And speaking of lucky! How lucky are YOU, having a "big bunny" human as devoted and loving as yours! What a team! You truly are one beautiful boy, Midnight, just as special as can be, and so very deserving of your big day of honor! Thanks for the BIG smiles, cutie pie! I hope you're enjoying a very special day of celebration...playing with your pink ball and Santa toy (even if it's not Christmas, hehe); warming your human's lap, receiving countless cuddles; munching on yummy treats; being loved and pampered to pieces! Lots of love, snuggles and kisses to you, beautiful Midnight, our very special and most deserving Pet of the Day, EVERY day! So great that you have time to snuggle with your person. Congratulations on being Pet of the Day, handsome Midnight! Dearest Midnight, you are adorable! What a beautiful young Lop Rabbit guy you are! You're so cute with that spiky "punk bunny" hair. You have the most delightful personality, too. You make your dear person smile with all your antics and energy. And how sweet that when he/she wears that fuzzy coat, you lick and nuzzle it as if she/he is a big bunny! You both love each other very much, don't you. What a wonderful love-filled home you share! 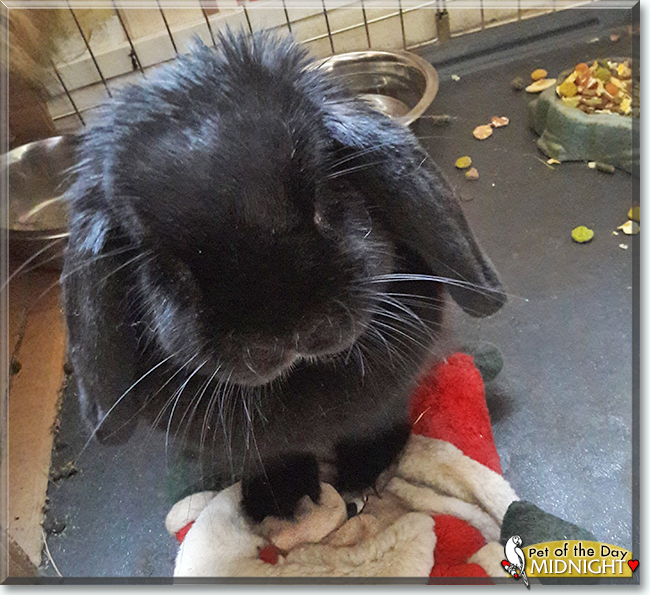 Congratulations, darling Midnight, on being chosen today's Pet of the Day! We hope you and your dear person and all your family and friends are enjoying a fine celebration, full of fun and lovies and all your favorite games and treats, maybe a special serving of dandelion leaves with lots of cuddles!